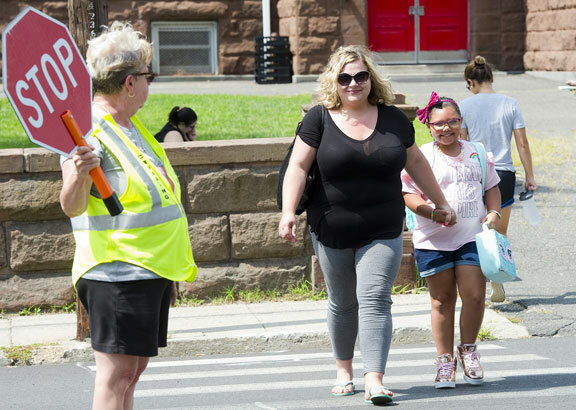 NAUGATUCK — Classes in the first week of school will be shorter for many schools in the area after excessive heat prompted school officials to dismiss school early. The National Weather Service on Tuesday issued a heat advisory that remains in effect until 9 p.m. today. Air temperatures are expected to hover around 95 degrees, with humidity pushing the heat index to 100 to 104 degrees, according to the weather service. The Environmental Protection Agency also issued an advisory predicting air quality “that is unhealthy for sensitive groups,” including people with chronic health conditions. In Naugatuck, school officials made the call for early dismissals at schools that are not equipped with air conditioning on both Tuesday and Wednesday. Superintendent of Schools Sharon Locke said some of the district’s older elementary and intermediate school buildings are not equipped with air conditioning. Indoor temperatures had already begun to exceed outdoor temperatures midway through the morning on Tuesday. So the decision to dismiss students early was made around 9:30 a.m. that day. Parents were notified about a half-hour later. “At the core of my decision is the safety of children,” Locke said, adding that making the call to dismiss students early is a challenge because of families’ varying needs. Naugatuck wasn’t alone in dismissing school early, while other districts canceled or changed after-school activities. School districts in most of Litchfield County made similar calls to dismiss early. In Waterbury, schools didn’t dismiss early on Tuesday, but will let out early on Wednesday. In Wolcott, schools didn’t dismiss early on Tuesday, but all after-school activities, including athletics were canceled, Wolcott Superintendent of Schools Anthony Gasper confirmed. Region 16, which is comprised of Beacon Falls and Prospect, didn’t dismiss early, but athletic practices for sports typically held outside were moved indoors on Tuesday. Salem Elementary School was among the seven older school buildings in the borough to dismiss early. “I don’t feel that it’s fair to the children to have to sit in a hot school, in my opinion,” she said, before crossing Meadow Street. Wanda Burke, a crossing guard for the school, said she found out about the early dismissal because she has a granddaughter who attends the school. Dawn Hughes, a parent of a first-grade student, said she was fine with the call. Lucien Ceran, the father of a third-grade student at Salem, said he was on his way to work in Danbury, when his employer received a call from his son’s school. “I thought something was wrong, my heart was racing,” Ceran said, adding he was relieved when he found out there wasn’t a medical emergency. Ceran said he does feel the call for an early dismissal should have been made a day earlier, so families like his wouldn’t have been forced to make last-minute arrangements. Ceran noted that with the early notification of an early dismissal on Wednesday he has already planned for a day off.